This Trulli are a unique example of ancient architecture that still survives and currently offers our guests the opportunity to experience a truly and authentic holiday in Puglia, together with the luxury and comfort of a private pool. The wonderful swimming pool is 10 meters long and 5 meters wide, with a maximum depth of 2.20 meters. It is equipped with a Roman staircase which is not only elegant but also very convenient for children. From it's panoramic position it offers a breathtaking view of the Itria valley and on the immense forest of oak trees. The outdoor area turns out to be spacious and well thought out. In front of the Trulli you can find a large table with masonry chairs and comfortable pillows. At the back of the Trulli, in the absolute silence of the garden, is a small breakfast area formed between the pomegranates and rosemary. Additionally, on the short side of the pool and overlooking the valley, there is a relaxing place with table and sun chairs. In addition are furnished in full compliance with the country-style chic and specific traditions. 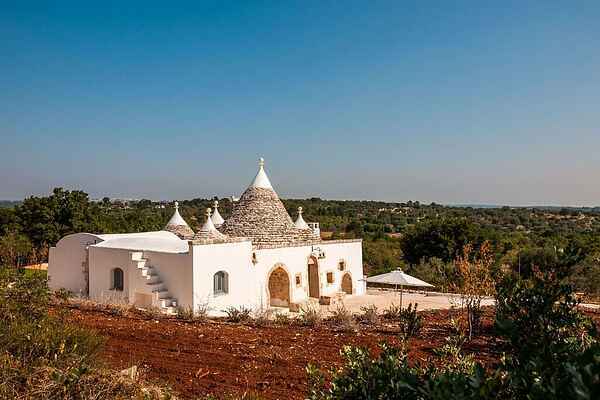 The furnishings of natural materials such as wood, stone, natural colors and pastels, are splendidly made and give the trullo a pleasant stylistic uniformity between interior and exterior spaces. The holiday home offers maximum privacy, is completely fenced with locked gates and therefore extremely safe for those who travel with kids.